Garth Crooks has named three Albion players in his team of the week, although he still isn't convinced the Seagulls can stay in the Premier League. Brighton won 3-0 at West Ham on Friday evening for their first-ever away Premier League win and now sit 12th in the top flight. Glenn Murray, who scored twice, along with central defenders Lewis Dunk and Shane Duffy have been named in Crooks' team of the week - although the BBC pundit says the Seagulls still need reinforcements in January otherwise the players could 'run out of gas'. Writing about Dunk, Crooks admits he wasn't sure the 25-year-old could perform in the top flight at first: "West Ham have conceded three penalties this season, which tells you volumes about the lack of confidence and coherence in their back four. "Should Joe Hart have saved the strike from Jose Izquierdo that put Brighton two up and on their way to a 3-0 win in Friday night's fixture? The answer is an unequivocal 'yes'. "However, none of that concerns Lewis Dunk. 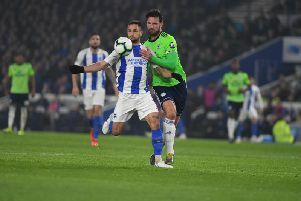 The Brighton defender has spent his entire career at Albion. To observe his development during his time in the Championship was interesting, but I wasn't sure if he could do it in the Premier League. There were people, manager Chris Hughton included, who told me he could. "His performances this season have been a steep learning curve but the player has coped admirably in some difficult circumstances. His performance against West Ham proved the point that Dunk is a player very capable of surviving in the Premier League. I'm still not convinced Brighton can." Duffy earned rave reviews on social media for his performance and Crooks said: "West Ham boss Slaven Bilic said he wasn't worried by whatever response greets him this week after West Ham's defeat against a rampant Brighton. "If he's not worried about his team's shocking performance, he should be worried about the West Ham fans streaming out of the ground with 15 minutes left to play. Board members listen to their fans. "The Hammers also failed to circumvent the performance of Shane Duffy on Friday. The Republic of Ireland international was outstanding along with his accomplice Lewis Dunk. Both defenders have been a formidable partnership in the Championship and now appear to doing a similar job in the Premier League. "The question for me is: can the brilliant defending and team spirit created by manager Chris Hughton sustain their presence in top-flight football? If it can, Duffy becomes very hot property - and so does Hughton for that matter." Muray scored his first Premier League goals for Brighton on Friday and Crooks said: "I've made it clear in the past how difficult I think it is going to be for Brighton to stay in the Premier League this season. However, if they are going to survive they need more performances like this from Glenn Murray. The former Crystal Palace and Bournemouth striker scored two goals and looked deadly against West Ham on Friday. "Murray is a clever striker and a canny finisher. But can Brighton get him far enough up the field to make his contribution count against the stronger opponents? "He is a player that seems competent in every department and never appears rushed. He is also no stranger to the big moment. He has scored important goals for Crystal Palace and Bournemouth before. "Brighton, though, are in perilous need of reinforcements. If not, they are in serious danger of running out of gas. If these players keep performing at the rate they will all collapse from exhaustion by January." Crooks' full team of the week was: Lloris (Tottenham); Smith (Huddersfield), Dunk (Brighton), Duffy (Brighton); De Bruyne (Manchester City), Mooy (Huddersfield), Ozil (Arsenal), Mahrez (Leicester); Murray (Brighton), Aguero (Manchester City), Kane (Tottenham).